A cloth fabric made of fine fiberglass strands woven at right angles to each other, fiberglass cloth is the most common composite material used in boat building, repairs, and reinforcing of wood. Fiberglass cloth is used with epoxy and this cloth is stronger than fiberglass matting. It is most often used in layered buildups. Fiberglass Cloth is available in various weights (thicknesses): 4 oz, 6 oz, 10 oz, 38 oz etc, to suit the needs of your project. 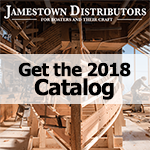 Jamestown Distributors is an industry leader in composite materials, with a large variety of fiberglass supplies, including resins, tape, and more.